Who says there’s no such thing as a free lunch … for kids? Kids spend the majority of their time, the majority of the year, in our schools. Therefore, kids are eating the majority of their meals at school as well. What happens when a family cannot afford to reload the student’s meal card, or the school options include soda and fried foods? That’s when the new Community Eligibility Program comes into play. The United States Department of Agriculture (USDA), following up on the Healthy, Hunger-Free Kids Act of 2010, is slowly implementing a new 4-year pilot program for school districts to offer free breakfast, lunch, and snacks to its students. The goal of the program is to realign the focus from hunger and a lack of proper nutrition back to education and a higher productivity during the school day. As Agriculture Under Secretary for Food, Nutrition, and Consumer Services, Kevin Concannon, reiterates, “ensuring all school children have access to healthy, well-balanced meals is critical to their ability to learn in the classroom, grow up healthy and to reach their fullest potential.” After all, no one can focus on an empty stomach. Eligibility for the pilot program stems from predetermined data based on families that are already utilizing the Food Stamp Program. School districts may use the Community Eligibility Program if a minimum of 40% of their students are entitled to public assistance on the Food Stamp Program. The meals are free of charge to the students and the USDA reimburses the school districts the cost of the meals on the notion that certain conditions are upheld. The impressive dedication to health and nutrition for kids comes into sight here as the district must follow guidelines for calories, portion control and nutrition in order to receive their reimbursements; i.e. 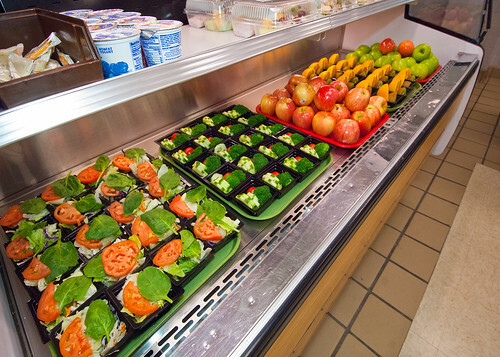 no student can leave the lunch line without a fruit or a vegetable on their tray. Schools are also introducing nutrition coaches to act as “cafeteria mentors” to visit elementary lunch tables once a week and discuss healthy eating habits. The Community Eligibility Program was first introduced at the start of the 2011-2012 school year for Illinois, Kentucky, and Michigan. The 2012-2013 school year added Washington D.C., New York, Ohio, and West Virginia. According to the Food Research and Action Center (FRAC), the future outlook will see four more states using the program in the 2013-2014 school year, with all schools nationwide (that meet the base requirements) implementing the program by the start of the 2014-2015 school year. Have younger kids at home? Check out these easy, affordable, and healthy lunch ideas suitable for both at-home lunches and brown-bag options! It seems healthier and more budget friendly to pack lunch for the kids. Good read.